Please let me know if you know of any issues and I will add them to the list below and fix them before the next update, thanks. DYN JOINT DESC SET MAX FORCE(fixed error in string table and documentation). Add/fix linear joint limits. Fix 'Joint Z Drive'. Add 'get position, get orientation', useful when physics controlling bones instead of objects. Add categories to help file. Write setup guide for DarkGDK. The maximum amount of actor groups is 0x7fff or 32,767 groups. This should already work with the current command set, if there is any difference in behaviour from before v1.11 it will be the removal of shape groups, although in most cases there will be no difference. Since groups are indexed 0 - 32,767 the current parameters for group commands (taking an integer) is sufficient and does not need altering. That said, there may be a need to change the raycast commands to accept 'unsigned int' to filter combinations of shape groups. - Reads textures from material(mtl) file. - Combine grouped limbs into one limb. 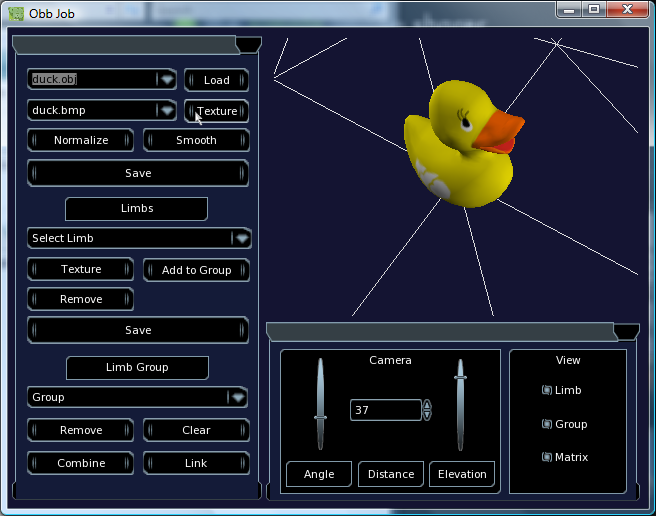 - New view options - View selected limbs only, view grouped, view matrix. I wish this was also a tool for phone development then you could recode this for opengl and agk. Linear Joint limits? I think you said they'd be in the next update. Commands to set those values are what I need. dynIsSleeping() or similar would be useful. I'm currently putting a few objects to sleep when their linear/angular velocities get low, to prevent them jiggling about. If the object is already sleeping though, I don't want to perform the speed calculations. Thanks for the reminders, I will update the list as soon as I get some time. I will look into all suggestions. @Fallout, I will get back to you soon on ragdolls. Matty, some sort of dynBoneGetAngle() command would be really useful to me. When I detect a collision with a projectile against my rag doll, I attach a blood emitter to that limb. That blood emitter position and rotation is updated as the game continues. Collisions provide me with the object and limb/bone ID, but I don't have a DB object to interrogate for the position/rotation. Using the dbLimbAngle/Position commands doesn't appear to work with the limb/bone ID returned by collision commands. I guess that's this distinction between what DB considers limbs and bones coming into play. In fact, just some simple dynActorGetPosition() and dynActorGetAngle() commands, which take an object or object+limb, would be really useful. I know normally you can interrogate the object dyn is controlling for this info, but in this scenario I don't think you can. Yes, there is a need for this now with the addition of bones so I will add it in, thanks for spotting that Fallout. Cool stuff. I'm uploading a vid right now which still has a good effect, so I'm happy enough for now. Interestingly I noticed that when I record my Fraps videos, with a fixed frame rate of 60 fps, the physics simulation becomes much more stable. So even though I'm using a variable timing interval with no step defined, simply locking the framerate to 60fps makes it much more reliable. Thought you might find that interesting. Imposing a 60fps cap on my game is fine, since any higher framerate doesn't look any better, so that's probably where I'll go now (and also switch vsync back on!). When is this update coming out? the thread hasn't been updated in a while. Quote: "So even though I'm using a variable timing interval with no step defined, simply locking the framerate to 60fps makes it much more reliable. " So varying the frame rate is ok as long as you snap to the nearest sub-step value. The following seems to be less reliable. Don't take this as gospel as I have not implemented a 'snap' system to be sure this theory is correct. I probably will try it at some point and post the results. Quote: "When is this update coming out? the thread hasn't been updated in a while." I will put some time aside very soon and hopefully get through the whole of the current list. If anyone's project is being held back by something on that list then let me know, I can then prioritise that feature/fix and perhaps release a minor update. I have finished updating the 'ObbJob' tool. I added extra features to help aid rigging vehicle models. Nothing too fancy, just the ability to remove limbs(wheels), save limbs(wheels) as separate objects and a few other bits and pieces. I can start on that list now so update should not be too far away. Quote: "Thought you might find that interesting. Imposing a 60fps cap on my game is fine, since any higher framerate doesn't look any better, so that's probably where I'll go now (and also switch vsync back on!). Sounds good Matty. I'm looking forward to being able to angle my bone based arterial spray properly. @Matty, is there any more scope in the contact report commands? I find them quite limiting at the moment. Here's my current scenario: i have a saw blade coming up through the floor chopping my players up. When they're dead, they become a rag doll. I want to be able to detect collisions between the blade and the rag doll limbs and create my blood and gore accordingly. My first issue coding this is assigning groups. Groups look like they can only be assigned to actors/dbObjects, rather than bones. So I've set my whole rag doll obj to a group. Hopefully that will put all limb objects into the same group, but as I'm dealing with other issues, it's not been testing yet. If it's possible to put different bones into different groups, that would be way better. That way I can perform limb specific collision checks and know which part of the body I'm dealing with. Alternatively, contract reports between my blade and rag doll (assuming this will work as I'm still working on it) won't yield the bone. All I'll have is the rag doll obj and the blade obj and no idea of contact position or which bone was hit. Would it be possible to add a dynContactGetBoneA()/B() command? I'll report back when I reach some sort of half solution and have a clearer understanding of what the limitations are. Edit: Ok, I can't assign a group to my rag doll as a whole, not set contact flags, so at the moment it's not possible to detect collision between rag dolls and the environment. So help with assigning groups to bones and potentially returning bones from contact reports would be awesome! Hello, are the soft bodies squashable ? How good is it really ? Is it fast ? Does it have easy to implement eye candy features like rope, cloth, fluid, soft body physics like squashable objects under load ? Does it have particles that can be controlled using physics forces like - gravity, wind, nuclear explosion etc. ? Which version of physx is it using ? Are all the features not implemented yet ? All features are implemented. I have simulated a rope using spherical joints on lots of rectangular objects. It has cloth, fluids/particles, and soft bodies. It has particles which can be controlled by gravity, wind and force fields. I will be updating again soon(see top post) and then I will try to do more videos/examples to demonstrate more features. There are lots of videos in Fallouts WIP 'Carnage', shows ragdolls etc. @Matty H: The absence of detailed example code for each of the effects is making me ponder whether I will be able to fully utilize all the features of your plugin with ease without having to tear my hair out in the middle of my work. Lack of detailed documentation and absence of every feature example makes the whole thing for new comers like me more tedious than easier. So can you please tell us why all the examples covering all features (at least the ones mentioned in the official TGC website) is not there in the help file ? Your plugin's features sounds real promising but before spending 60 USD I want to make sure whether the learning path will be smooth and all the feature implementations are explained thoughtfully, so newcomers like me understand it without having to depend on somebody else's mercy. More detailed docs would be helpful, but really there's no substitute for following an example program, and Matty has provided examples for the vast majority of the features. Best way to learn imo! @Fallout: Do you mean examples are available for all the features ? He provided a help file did not cover examples for all the features, that is why I am asking. Do you use Dark Data and STYX ? Are they of great use or free community developed alternative plugins are available ? Never used them and no idea what they do. I'm currently using DynamiX, Dark Lights and Enhanced animations. Yes, Dark DynamiX comes with example programs which demonstrate the majority of the features. I was able to scan over the example programs and then implement the concepts in my game fairly quickly. There will probably be more added in the future. @Matty H: Hello Mike ,after buying will you help me if I am stuck in specific cases - like wind, rope, tornedo, squashable softbodies etc. ? Or will I be on my own ? Does Dark Dynamix work with U77 or do I have to use U7.62 ? No confirmation on this ???? I assumed Matty's name was Matt, not Mike. @Juggernaut - This board is dedicated to Dark AI, Dark Physics and Dark DynamiX, so yes you can just post here for help. Matty can't guarantee to support you directly with all your questions though. For that kind of support with any software product you would have to pay for a service level agreement i.e. a monthly fee. The price tag does not warrant a support commitment beyond bug fixing. In my experience though, any technical issues (problems/failures) Matty will be quick to help and resolve the issues. Otherwise, for general use issues, you will just have to get support from the community, as you would with any product. You're asking too much if you expect to pay a small price tag for some software then have the developer give you 1 to 1 support with all your coding challenges. @Juggernaut - You will need to use U7.62 or any official release after that one. You will not be able to use any beta versions which were released before U7.62. Since I am asking too much .... I should look elsewhere I guess. Quote: "Since I am asking too much .... I should look elsewhere I guess." No problem Juggernaut, you should not spend your money unless you are convinced it will suit your needs. I have updated top post. I have reworked groups to be more flexible and I will provide new examples to demonstrate how they work. It is possible that you may have to change existing projects slightly to take new changes into account, I always try to avoid that happening but may not be possible this time. v1.1 has been available to download for a while now. It should be available to download on your account. I have finished reworking 'groups'. Here is the example[GDK], you will see that there is not much difference but there is added flexibility. //-- tests such as raycasts so you only check the groups that are required. //-- There are two types of groups, 'shape' groups and 'actor' groups. Actor groups are orthogonal to shape groups. //-- This can be a little confusing at first but provides great flexibility. //-- such as raycasts etc. As well as disabling/enabling collisions between groups. //-- Actor groups allow you to setup contact reports between a large number of different actor groups. //-- Create physics for objects. //-- All actor groups will NOT generate contacts by default. //-- All actors default to group 0. //-- Set actors to different groups. //-- Generate contacts between our actor groups . //-- Note: We can't disable group collisions at actor level the way we can at shape level. //-- All shape groups will collide with all other groups by default. //-- Raycast commands can be filtered using shape groups to avoid unnecessary checks. //-- Here we place shapes in different groups. //-- We can turn off collisions for a specific pair of shapes. //-- NOTE: We can't manipulate contact reports at shape level as we can with actor pairs. //-- Ray originates just above ground level and set back along the z axis. //-- Ray direction is forward along the z axis. //-- Simple raycast, simple but not optimised. //-- Advanced raycast, optimised since we are narrowing down the amount of shapes that will be tested. //-- We test for just dynamic shapes in any of our 3 groups. Getting pretty close to finishing what is currently on the todo list in the first post. All looks good. I am slightly confused by Actor Groups and Shape Groups looking at the example, but hopefully it'll become clear when I use them. With regard to my issue with contact reports for rag dolls, I can't see the solution in your example. I'll have a rag doll with different actors attached to different bones. It looks like the dynShape commands allow access to bones, but there is also the note in your example saying you can't manipulate contact reports for shapes. Looking at the dynActor commands, it looks like you can set collision reports and turn collision on and off, but you wouldn't be able to access the bone physics object for a rag doll since it's not an actor in it's own right. Or at least, you can't access it. So not quite sure how with these changes it'd be possible for me to set the bones of my rag doll to create collision reports. And one further request: can you please add a simple little command dynGetVersion() which simply returns an int maybe, for the version of the plugin. I ask for this because last time I updated, I spent quite a while messing about making sure I was using the new library. Can't remember exactly what my problem was, whether I was getting it from the wrong place, or hadn't overwritten the old one in the correct folder etc. but I could never be sure my executable was using the new version. The easiest way to check would be for us just to print dynGetVersion() to the screen at start up. Hi Fallout, the following commands have been added although they are not included in the example provided as I don't want to make it too confusing by talking about limbs/bones in that particular example. In your case you would use dynSetGroup(int objectID, int limbID, int group). You then use the same commands as in the example to tell those two groups to generate contact reports. I will add a getVersion() command, good idea. I remember you mentioning you had issues, similar things have happened to me in the past with other programs. It may have been that some of your object files had not been recompiled with the updated version, maybe. Nice one Matty. Sounds like that'll do the job perfectly. I'm new to C++, so the environment configuration is new to me, so was probably something I neglected. Either way though, with all the noobs on the board, it'd be a useful command. When someone says something isn't working, you can also tell them to print that value to the screen so you're sure they're up to date and you don't waste your time. I still need to update the DBPro dll with the new commands as well as do DBPro versions of any new examples. So getting close but still a little bit to do before update is released. Sounds awesome. I might have to delay my update for a few weeks as I'm in the middle of something and don't really want to rejig any physics stuff right now, but then I'll be on it. One more request. When my players die, I swap their body for a rag doll body. What I want to do be able to do is take the linear velocity of the player and apply this to all the rag doll bones/capsules when it is created. So if the player is running, the rag doll carries the same velocity when it is made and moves in the same way. There isn't a way to do this as the dynSetLinearVelocity command doesn't have a bone parameter. The dynSetLinearMomentum command does, but since the rag doll and player are different (densities, bones structures etc) I can't simply set the momentum as the calculations would be different. I need to set the velocity. Is it possible to add a dynSetLinearVelocity overloaded command which accepts a bone parameter, or is this some sort of PhysX limitation? Cheers for your help Matty! Yeah, that's not a problem, I will add asap. PhysX does not know what is a bone and what is an object, they all behave the same as far as it's concerned. Ahhh. Good stuff! Yes, that's what I suspected. Under the covers it must just be a bunch of actors connected or not by joints. That velocity thing will be cool. Can't wait to set my rag dolls to the correct velocity upon death. It should make a big difference to how they fall down. I may also look at calculating individual bone speeds based on animation frame changes and apply them to each bone. So if the player is in the process of swinging a sword when he is shot for example, the momentum of the arm movements would cause him to spin around. At least that's the theory. Nothing happens as you expect it to in physics. so that we can create realistic effect of wall blasting or something exploding etc. My idea is we create the animated/static object in blender and create fracture in it and then load it within Dark Basic Pro or Dark GDK and then call the destruct function by passing in the loaded object's ID. This is possible and may not even be that hard to implement with some limitations. I may have a way to produce a soft body which falls apart into chunks, I actually did it by accident once and then fixed it . But you would not be able to texture the object since it has no UV data, you should be able to apply a shader to it, would that be of any use? What if I texture the object (say a cube) in blender by using UV unwrap and hand painting it and create fractures in the cube in blender) and then export the whole thing as .3ds or .x file. Then when I load it in Dark Basic Pro or Dark GDK and apply your physics command to have a real-time destruction effect - will it work ? My idea of having a fully destructible environment in dark basic pro perhaps - something that big guns like Crytek and UDK already has. UDK uses APEX. But there is no APEX plugin available for blender currently. Why do you think that textures won't work in this scenario ? Actually this feature is already available in another engine but I am not going for it yet. Have you got an e-mail so that I can converse with you in private ? The technique I am talking about makes an object from volumetric tetrahedral mesh(created with PhysX viewer), it is only normally used internally by PhysX for simulation purposes, but you can turn it into an object and set it up with physics so the tetrahedrons all fall apart. I'm sure you could create a custom effect similar to what you are after with what is already available, you could make a cube out of 8 smaller cubes and set them up as limbs, then Dynamix could make a separate actor for each one and you would get the effect of the larger cube falling apart? Can this effect (as shown in the video) be achieved by the method you are describing ? By the way .... what is the procedure of embedding a youtube video ? The effect I described will be as good as you make it. 8 perfectly uniform boxes will not look as realistic as 8 non uniform, different sized shapes splitting apart, but that is more work in your modelling program for each section. Also the more complex the slower it will run so it's up to you to find the balance which suits you. With the code after the = in the url placed in the middle. So for that video, 8JtAdTon0JA. So, I create the pieces in blender and then load them in Dark Basic Pro and glue them together using limbs to form a single object. Then when I call your destruct function do I have to pass each separate ids of the pieces ? It would work however you design it to work. Since Dynamix allows you to make actors from individual limbs, just export your model in a way that it is composed of multiple limbs which will fall apart when physics is added.